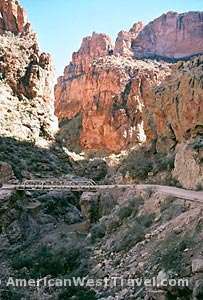 President Theodore Roosevelt called the Apache Trail "one of the most spectacular best-worth-seeing sights of the world". Roosevelt drove the road by car in 1911 on the way to the dedication of the lake and dam named in his honor. Construction of the Roosevelt dam and the modern Apache Trail, intended to serve the dam's construction, began in 1905, and marked the beginning of the massive water storage system without which modern Phoenix could not exist. Today, the Apache Trail continues to be a gateway to spectacular, unspoiled scenery as well as outstanding water recreation on Canyon, Apache, and Roosevelt Lakes. The route twists and turns through contorted canyons and desert saguaro forests. It features twenty unpaved miles between Tortilla Flat and Roosevelt Dam, including the tortuous and thrilling drop down Fish Creek Hill. The route drops about 900 feet in a mile into Fish Creek Canyon. From canyon bottom, the sheer rock walls of the Superstition Mountains tower nearly 2,000 feet above you. From the Phoenix metro area, the 41 miles of Apache Trail can be include in an outstanding scenic loop drive. Head north from Apache Junction on Arizona-88 (the Apache Trail) to Roosevelt Dam, southeast on Arizona-98 to Globe, then west on US-60 through scenic Devil's Canyon back to Apache Junction. The distance is about 120 miles but expect the drive to take most of the day. There are campgrounds near the lakes if you wish to take longer. The Apache Trail - American West Travelogue (complete article).